Monkeys and other primates, like lemurs and lorises, might not be the most common pets we find in households across the U.S., but the trade is widespread and it's causing both suffering for them, and posing dangers to us. According to the Animal Welfare Institute, it's conservatively estimated that there are somewhere in the neighborhood of 15,000 primates being kept as household pets across the nation. While there are a patchwork of state laws and regulations across the nation that deal with primates as pets, people can still easily get them online, at auctions and from out-of-state dealers, which animal advocates believe makes federal legislation necessary to close the gaps. Sadly, for primates involved in the pet trade, problems range from infants being torn from their mothers, mutilating them to make them less dangerous to keeping them in conditions that either don't meet their needs or are blatantly abusive. Even more trouble can come when those cute little babies get too expensive, active, destructive, large or difficult to handle and there are few places for them to go. Not only is the pet trade hurting primates, it's also putting our health and safety at risk. According to Born Free USA, since 1990, approximately 300 people — including dozens of children — have been injured by primates, while many more incidents go unreported. They also pose disease risks to us, including Ebola, tuberculosis, and herpes-B. Now, there's a chance to protect both them and us from this inhumane trade. Reps. Earl Blumenauer and Brian Fitzpatrick have just reintroduced the Captive Primate Safety Act, which would amend the Lacey Act to include primates in the list of animals who can't be bought or moved across state lines as pets. 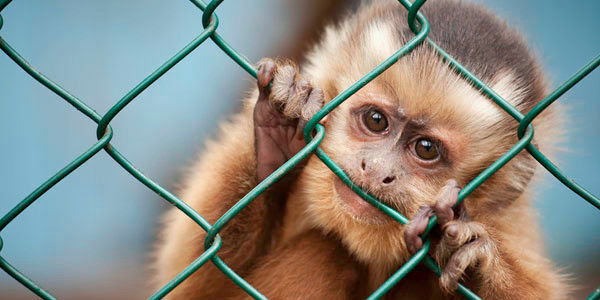 Please sign and share the petition urging Congress to pass the Captive Primate Safety Act.